Note, Iraq and the United Arab Emirates show up further down the list. 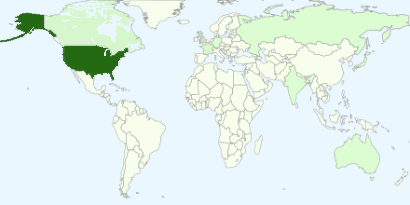 Interestingly, no Hong Kong or China readership, unless they are using proxy queries from other countries. Given the Chinese dominance in attacks on my Linux box, this seems to again validate that China is the real cyber bad guy in the world. Nothing happens without either tacit approval or outright sponsorship of the Chinese government. That's my assertion and I'm sticking to it, until at least someone proves me wrong. I am, after all, frequently wrong but never in doubt.